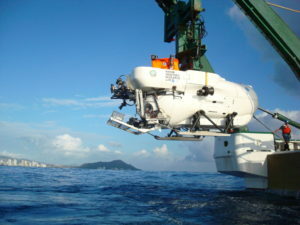 Previous HUMMA projects had numerous successes including developing an effective, cost-efficient approach for locating sea disposed munitions and demonstrating the capability of human occupied vehicles (HOVs) for sampling sediments and water 1 to 2 meters (m) from targets of interest. However, munitions potentially including chemical warfare materials (CWM) were not located and investigated during the 2007 and 2009 HUMMA Study efforts; thus, the DoD cannot make informed decisions regarding the location, impacts, risks, and alternative actions that might be taken regarding these CMW disposal locations. The University of Hawai’i at Manoa (UH) was subcontracted by Concurrent Technologies Corporation (CTC) who was contracted by the U.S. Army under Contract Number W91ZLK-10-D-0005, Task Number 771 to develop a Sampling and Analysis Plan (SAP) in support of the HUMMA-III field programs. HUMMA-III’s efforts is to identify and begin to close data gaps specifically addressing the green-banded munitions (likely chemical munitions) that have subsequently been discovered; and, to evaluate performance differences between HOVs and remotely operated vehicles (ROVs) in visually mapping and sampling sea disposed munitions and test a new group sensors and instruments for their ability to conduct assessments in the future. The overarching plan is to conduct two separate deployments to evaluate and compare techniques for sampling and imaging discarded military munitions DMM that have been tentatively identified as containing chemical agent (CA). The first deployment will use a combination of HOVs during the day and a towed camera system at night to collect physical samples and imagery. The second deployment will have approximately half the duration of the first and use an ROV operating around the clock to collect analogous datasets. Photographs and video footage from a 2009-2010 commercial survey conducted by the State of Hawai’i’s Department of Business, Economic Development, and Tourism (DBEDT), SONAR data from the 2011 HUMMA SONAR Survey, and HUMMA-III reconnaissance activities will be used to identify target areas that may contain chemical warfare munitions (CWM). Both ROV and HOVs will be used to collect samples of sediments, biota, and the products of munitions casings corrosion in the vicinity of DMM. The ROV will additionally be used to collect infauna samples as well a munitions fill directly from the munitions casings. Control areas located outside of the study area will also be sampled. The samples will be analyzed for a list of constituents of potential concerns (COPCs). The HUMMA team will prepare a Final Report that will entail a review of relevant and available research studies, background information, and the results of the sampling and analysis of HUMMA-III. The Hawai‘i Undersea Military Munitions Assessment (HUMMA) project team conducted a side-scan SONAR (SSS) investigation of the study area in August 2007. The purpose of this investigation was devoted to completing a wide-area reconnaissance survey of the area south of Pearl Harbor to compile an inventory of foreign objects on the seafloor. Data analysis suggested that thousands of man-made objects were detected, including several scatter fields of multiple munitions objects within the survey area. In March 2009, the HUMMA project team revisited the area with underwater ROVs and deep-sea HOVs to identify the disposal sites and to confirm the presence of disposed military munitions. Munitions were found which confirmed that munitions were dumped off ships as they steamed forward. Any munitions object encountered during this investigation was visually assessed for casing integrity. Records were sent to experts for munitions type identification. Water and seafloor sediment samples were collected in the vicinity of the identified disposal sites and at control sites away from the identified disposal sites. Samples were shipped to mainland laboratories for analysis for explosives and chemical agents and their breakdown products to assess any potential impact of the undersea munitions on human health and the environment. 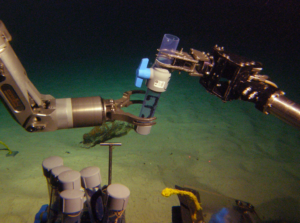 From April through May 2009, a separate field effort was launched to collect human food item biota samples in or near the HUMMA Study Area took place and from where the submersibles collected water and seafloor sediment samples. The two targeted food items likely to be consumed by humans that were sampled were a highly prized finfish Etelis coruscan (known locally as onaga) and a commonly eaten shrimp Heterocarpus laevigatus (ama ebi). 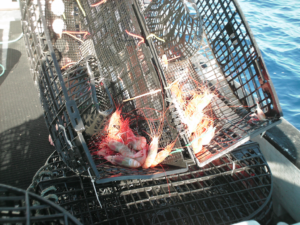 Samples were caught using the same methods that commercial and recreational fishermen use (e.g., rod and reel for fish and traps for shrimp). These samples were prepared, sent to the mainland, and analyzed for deformities, eroded fins, lesions, and tumors, as well as for chemical agents, energetics, and metals. • Most munitions in the HI-05 Study Area were disposed of by ships that were underway as munitions were cast overboard. • The integrity of munitions in the area spans a broad spectrum, with even the best-preserved munitions casings deteriorating at a yet-to-be determined rate. Skirts and pedestals observed at the base of munitions may be the result of rusting, possibly in combination with leakage of munitions constituents. • The analytical methods used to detect munitions constituents during the program were effective. With an exception of an unidentified detection of mustard, neither chemical agents nor explosives were detected in any samples. • Analysis of sediment samples collected around several munitions showed relatively little influence from human activities or man-made objects. This is significant given that the samples were taken within six of the munitions. • The observations and data collected do not indicate any adverse impacts on ecological health in the HI-05 Study Area. • The risk to human health from the consumption of fish and shrimp collected near the HI-05 Study Area within Environmental Protection Agency acceptable risk levels.